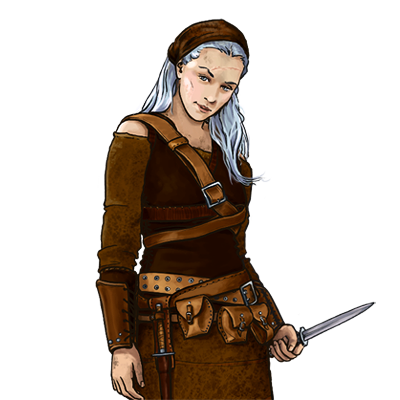 Beautiful and letal, Alena fights with a dagger and poisoned throwing knives. She can move fast in woodlands and she is able to sneak past enemies. Special Notes: If there is an enemy of the target on the opposite side of the target while attacking it, this unit may backstab, inflicting double damage by creeping around behind that enemy. This unit’s skill at skirmishing allows it to ignore enemies’ zones of control and thus move unhindered around them. The victims of this unit’s poison will continually take damage until they can be cured in town or by a unit which cures. In woodlands, this unit’s ambush skill renders it invisible to enemies unless it is immediately adjacent or has revealed itself by attacking. This unit’s skill at skirmishing allows it to ignore enemies’ zones of control and thus move unhindered around them.